If fast and furious lyrics combined with swift bingo action are your cup of tea then RAPchic Bingo is for you. Whether you like have a favorite rapper or you simply like to rap-tap-tap on your keyboard there is an abundance of fun and thrills to be had by one and all! RAPchic Bingo is grabbing a new generation of players with a rapper themed site. Hip hop on over and get your groove on at this party central hot spot. The radio is waiting to be plugged as you tune in and tune out of the everyday workload and unwind with roomies. The hot pink design is electrifying with a “deck” that replaces the ordinary wheel to spin your way to a bundle of cash. The online bingo launched in April 2013 and has all the attributes of a rapping good time. Jumpman Gaming software powers the platform of products and is a massive surge of brands that are beginning to pop up like the rappers top ten hits list. Fully registered and licensed by the Alderney Gambling and Control Commission, RAPchic is also a member of the 15 Network. It’s pump of the volume on these Bingo games featuring 75 ball and 90 ball bingo. The games are always hopping with fun variety that makes your playtime that much more exciting. Progressive Jackpots and Weekly Jackpots throws in an element of high adrenaline rush to your game. Grab your friends and enter the competitive action of Team Bingo for a chance to win massive Loyalty Points. While you’re spinning those records take another spin on a handsome selection of Slots! For those who have a thing for Vampires playing Vampires vs Werewolves is the perfect machine. For a bunch of pay-lines try Amazon Wild with 100 winning line combinations. For alternative spinning European Roulette has a wheel going round and round 24 hours a day. The promotions never go out of style and players can always depend on some pretty amazing standard offers they can rely on from week to week. As you jam through the playlist of games and are ready to play in real money mode there is a lucrative offer to all new players. The First Deposit Bonus will take your starting credits to a brand new level plus is enhanced as you take a spin on the Deck with a chance to win a massive additional Bonus. There are week day specials including Monday Madness where bingo gets wild and crazy with reversed prizes for one line and Full Houses. Wednesday is Lucky Lotto where players can win a bundle of Loyalty Points. The Slots Squad is your tournament destination to great prizes that takes place every week. Weekend Wad is your chance to win even more Loyal Points and Friday night is Take Away where you could win a Free meal delivered to your door. Coming from the Jumpman Gaming software camp, it offers a refreshing new approach to your bingo experience. Promotions are pretty much permanent standard offers which on one hand is reliable, yet adding new exclusives to the mix would be nice for a change of pace. We rate RAPchic Bingo with 3 Pink Hearts. I was pleasantly surprised to come across this site last month. Upon first glance, I found the layout to be nice and colorful, as well as clear and organize, setting the tone for a great new site. After playing for a couple of days, I found that I really liked the majority of what they had to offer. They start you off with a nice little welcome offer. Every new guest that joins the site will receive £20 absolutely free when you make a deposit of at least £10 upon joining. I found this to be a great deal. Yes, it’s no no deposit bonus, but it’s still a pretty fantastic offer! 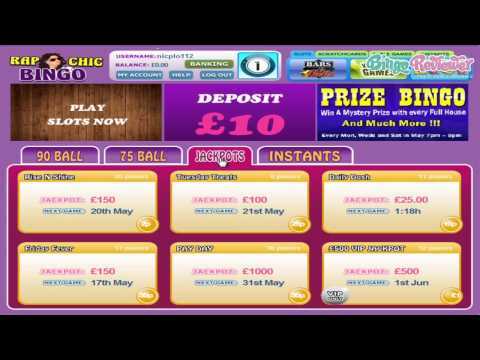 They offer the classic variations of bingo: 75 and 90 ball and the jackpots can be very nice. They also have one of my favorites which is team bingo. That’s always a great addition to any site and really makes things more fun. One thing I noticed though, is that their overall selection of games is not very large. Can’t wait to see the review on it! This site is still pretty new but I am happy with it so far. They have a wide variety of games to choose from. New members at the site are given £20 free after making an initial deposit of £10. I wasn’t super impressed by this but then again, I have come across much worse. In addition to the semi-free cash, they also allow you a chance to spin the deck for an additional free £5- £2,500. This definitely helps to start your gaming experience out on a pretty good note! When it comes to bingo, their selection is a little on the smaller side but they still provide you with the common favorites which consists of 75 and 90 ball. It would be nice to see a couple more options available here but with the jackpots they have up for grabs, this becomes less and less of an issue as you’re playing here. I still enjoy to find new Bingo sites, specially because most of them have interesting offer for new players. This one didn't really impress me, since all you get is a £20 bonus for a £10 deposit. Oh, and you do get a spin the wheel chance to win some cash (from £5 to £25,000) but I don't think there are many players that won a lot there. The site looks great, really fresh and interesting, with attractive graphics. Easy on the eyes and fast to navigate, I only wish more sites were following those guidelines. This is a good place for those who prefer classic bingo, since all they have are 75 ball and 90 ball games. Not bad, but it would be nice if they add something else, like the 30 ball bingo, or the 5 lines bingo, which are really becoming very popular. New players only, min deposit £10, £8 max win per 10 spins, max bonus conversation £250, 40x wagering requirements and full T&Cs apply.